Provide comfort for the family of Elizabeth Haley with a meaningful gesture of sympathy. Elizabeth Gorham Darnaby Haley, 98, widow of Kelly Cunningham Haley, passed away Friday, February 8, 2019 at Bourbon Heights Nursing Home. She was born May 25, 1920 in Bourbon County, daughter of the late Ernest and Virginia Bell Darnaby. Mrs. Haley was a graduate of Clintonville High School and attended the University of Kentucky as a Home Economics major and was a member of Alpha Gamma Delta sorority. 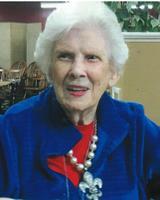 She was a member of Clintonville Christian Church (Disciples of Christ) where she was active if the Christian Women’s Fellowship, a member of Bluegrass Garden Club, Village Square Homemakers, her bridge group, the original supper club, Isaac Shelby Chapter of the Daughters of the American Revolution, and First Families of Kentucky. Mrs. Haley is survived by her three children, Ann Thompson Haley (Jerry) Morris, Paris, Kelly Darnaby (Marilyn) Haley, Evansville, Indiana; Elizabeth Carol (Walter) Gander, Shelby County; six grandchildren, Kelly Clayton Haley, Kari Haley Dornburg, Leslie Thomas Shepherd, III, Elizabeth Haley Shepherd, Virginia Gander Hazelwood, Rebecca Gander Gedney; her nephew, Charles Robert Minton; and thirteen great grandchildren. The family will receive friends on Wednesday, February 13, from 9:30 a.m. until 11:30 a.m. at the Clintonville Christian Church followed immediately by a memorial service at 11:30 a.m. officiated by Rev. Charles H. Kemp. In lieu of flowers, memorials are suggested to Bluegrass Hospice Care, Bourbon Heights Nursing Home, or Clintonville Christian Church. To send flowers in memory of Elizabeth Gorham Haley (Darnaby), please visit our Heartfelt Sympathies Store. We encourage you to share your most beloved memories of Elizabeth here, so that the family and other loved ones can always see it. You can upload cherished photographs, or share your favorite stories, and can even comment on those shared by others. Provide comfort for the family of Elizabeth Gorham Haley (Darnaby) by sending flowers. I worked with Elizabeth in Keypunch at the Lexington Army Depot in the early 1970s. I have fond memories of her; she was very quick witted and a ton of fun. My thoughts and prayers are with her family during this time.